The painting is famous, but John Brown never did kiss a black child before he was hanged. 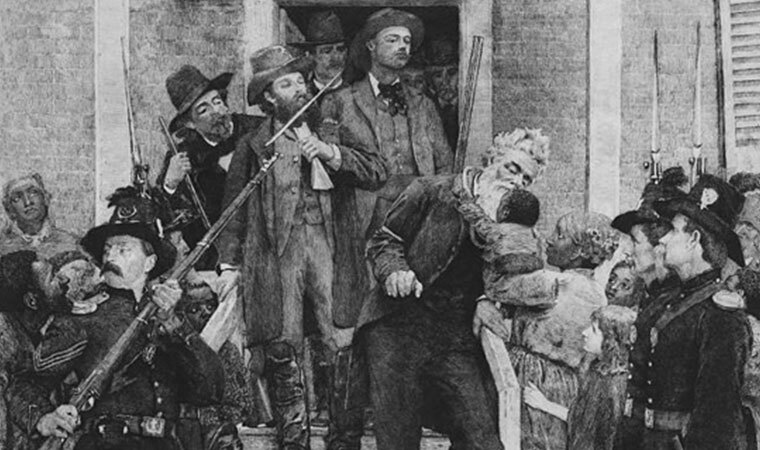 Today is the anniversary of John Brown’s execution in Charles Town, Virginia [at the time]. For almost 160 years, this collision of facts, fancy, characters and actions have had an impact on the United States. While it did not spark the slave insurrection that Brown and his followers hoped for and certainly not the republic they wanted to build in the Virginia mountains, the raid further deepened the divide over slavery, the wolf always howling at the door. The raid, the trial and the hanging in a large field was months-long drama nationally. Yet, in the end, Henry Wise, the Virginia governor, who had insisted on trying Brown and his men on state charges, treason among them, local officials and state military figures, like Francis Henney Smith, superintendent of the Virginia Military Institute, kept the public away from the execution. A few reporters were allowed into the fenced-in field, but confined to a specific place. In fact, they closed down all telegraph and rail communications into the region, told shop owners to shut down, churches to remain closed, and residents to stay inside their homes throughout the county. Sharpshooters were posted on top of courthouse buildings, and federal soldiers under Lieutenant Colonel Robert E. Lee joined Virginia militiamen in setting up road and turnpike checkpoints. Among the “military” that cool December day who were on the execution grounds was John Wilkes Booth, the smooth-talking actor who had schmoozed his way into an extremely temporary stint as an acting assistant quartermaster for a Richmond militia company. He was so sickened at the hanging that a soldier standing next to Booth thought he was going to faint. Booth wanted, but did not receive a drink to steady his nerves. In the ranks of the VMI cadets was the ancient, wild-haired, fire-eating secessionist Edmund Ruffin because he wangled a witness spot from Smith. After the cadets were dismissed, Ruffin went back to his room a very tired man because he had also spent the hours before dawn on a patrol of the courthouse. He was intent on sending to each of the governors of a slave state one of the pikes Brown had planned to arm the freed slaves with in the uprising as a reminder of Northern intentions. He did just that, except to Delaware. Commanding a battery of cadets with their small cannon to keep any crazed abolitionists at bay who would try to rescue Brown that day was Major Thomas Jackson. Jackson became far better known following the first Battle of Manassas [aka Bull Run]. On this day, he worried about Brown’s soul because he had rejected any ministering from all clergy who supported slavery. Also in Jefferson County then and likely on the field were Army officer J.E.B. Stuart, a cavalryman, and Marine Corps officer Israel Green. They were the men who led the charge on the small engine house where Brown and a few of his men had retreated to and taken a number of hostages with them to use as human bargaining chips. There were almost a thousand men and boys in the ranks or patrolling the fence line that day. No, John Brown did not kiss an African-American baby or child as he was led from the jail to the wagon that took him to the execution grounds. He did remark to his jailer when they arrived near the scaffold how beautiful the view was of the rising mountains to the south and that he had never taken the time to admire it before. Seventeen months later, there was civil war; and Union soldiers on the march would be singing about Brown’s grave.